Click here to view THE LIST and become a Secret Odin for an unclaimed player! Players can still volunteer to be Secret Odins for unclaimed players until DECEMBER 25! It is highly recommended that all Secret Odins obtain their gifts by that date. GIFT EXCHANGE WILL COMMENCE ON DECEMBER 26 AT 10:00PM PST (6:00AM GMT, UTC). All participants are to meet under the central Lutie tree (green area) to do the trades. You will be giving the gifts directly to your chosen player(s). If you prefer to be anonymous, then you can give the gift to me and I'll pass it on to the player(s). Players whose names are not claimed will receive a random cooked food from me. Christmas fireworks, Santa Suits, and Santa Hats are encouraged. There will be an audio side of the event taking place in the iRO RaidCall's Renewal Events channel. Feel free to join the RaidCall for the complete experience. As we want to limit the amount of lag everyone gets, please DO NOT USE SKILLS during the event. Thank you in advance for your cooperation. Now that we've got ourselves a list of (154) players and there are still people volunteering to be Secret Odins, we will now start planning the actual event. First, I will read off the in-game name of all claimed players. I'll be typing the character's name in-game as well as read it aloud in the iRO RaidCall. I will NOT be calling out the names of the Secret Odins so all Secret Odins should pay attention to which player names I call out. 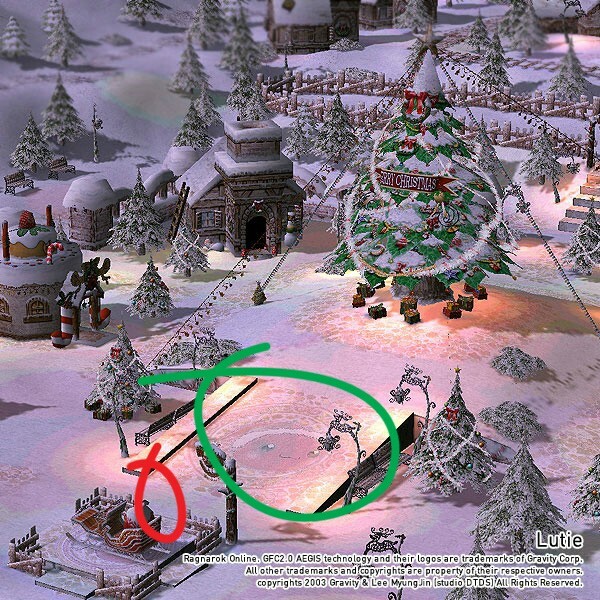 At that time, both the player and the Secret Odin will walk over in front of the sleigh between the green and red areas and perform the exchange. After all claimed players have received their gifts from their Secret Odin, I'll start reading off the list of unclaimed players to receive their consolation gift from me. As you are all well aware, the iRO community consists of not only players from the USA but all over the world from Asia to Europe. Therefore we must now decide on a good time (PST) when we can all meet. I know some players have suggested having the event split up into several meeting times to accommodate all players, but I would prefer it if everyone met at one set time to make it easier for Secret Odins to meet and gift their players. (In case players are available for a certain time, but their Secret Odins aren't.) But nothing is set in stone for now so let's make suggestions here and try to reach a consensus. Event officially confirmed for 10:00PM PST (6:00AM GMT, UTC)! Edited by ZeroTigress, 26 December 2013 - 07:05 PM. That's 10:00PM for me, I'm good with that too. That would be 9pm for me...works for me. So far, might end up having family dinner that night, not sure. Thats like 12 noon Friday here. Probably not be able to make it since I work at night and usually asleep at that time. But I'm gonna try to stay awake for this. I will just hand you the gift if I feel too sleepy. Hmm, so far so good on the time. That's some epic Paint spraying you got going there. Took some time to convince a Rogue to use colored spray paint. that 8pm for me! i will be there! That is 5 AM for me, as this is a working day I won't make the start of the event. I hope I'll be able to come by at around an hour into the event to take part for about half an hour. Then I would need to leave for work. How will gifts for people who are there but their secret odin isn't there/people who aren't there to receive their gift be handled? Edited by Daray, 08 December 2013 - 10:42 PM. What would be a better time for you (in PST)? If there are Secret Odins that are unable to attend, they can give their gift to me and I'll pass it along to their players. Edited by ZeroTigress, 08 December 2013 - 10:44 PM. It's 5 am for be too... Since I have bad sleeping habits, for me it would be perfect if it could start 2-3 hours earlier, as I assume it will take a while too. That's 2 AM for me and it's pretty good. Anything in the 3PM~8PM PST range is great for me. Edited by TheGull, 09 December 2013 - 03:20 AM. 5 AM for me too - I'd prefer it to be 2 hours earlier to be honest (4-6 PM PST), but I dunno, some people may have dinner at that time? What about 10 PM PST? This should be 8 AM GMT. Perfect time for me personally. Well, the event will last, I hope, for a few hours. Can't imagine the face of someone who got chosen, be all giddy and bam no secret Odin at the start. A few hours later, "HO-HO-HO-HO" (or whatever "war cry"(!?) Odin uses). Good stuff. if everyone puts down when their time is (like for me its 8pm) then the secret odins can look and see if they can make the time if not just hand the present over to zero. It's really nice that you want it to happen at one time but it's one day after Christmas ..
And people from all over the world!!! It would need a Christmas miracle!!!! That day is boxing day, but good thing its in the PM because if it was AM people would be at the mall buying things at 50% off! Would anyone be opposed to having it on Christmas day, 10 PM PST? That's 4 AM for me, I'll see what I can do but can't promise to be there at that time. Okay, we'll move it back to the 26th. But how about the newly suggested 10:00PM PST time?